By Arthur Mathews and Michael Nugent. With Gary Cooke, Risteárd Cooper, Tara Flynn, Dessie Gallagher, Paul McGlinchey, Malachy McKenna, Mario Rosenstock, Joe Taylor, Gemma Crowley, Nicky Elliot, Ryan O'Connor and Colin Middleton. Directed by Peter Sheridan and running in the Olympia Theatre until 05 March. The decision by McCarthy to send Roy Keane home from the 2002 World Cup divided a nation. Those, with only a passing interest in the beautiful game, soon become embroiled in much heated debate as to who was right and wrong. Coming shortly after a mundane General Election campaign, what was to become known as the 'Saipan affair' enlivened those rain-lashed days at the end of May 2002. Three years on, however, there is, perhaps, a sense of 'what was all the fuss about?' Those who may have needed counselling at the time should now be free to resume normal living. Roy is playing out of his skin for Manchester United and is back in the Republic team, while Mick may be on the verge of sending his new employers Sunderland back to the promised land of the Premiership. Nevertheless, the story of Saipan was always ripe for some form of artistic endeavour. Arthur Mathews and Michael Nugent have combined to bring us 'I Keano' – a musical that shifts that most talked about fall out in Irish sport to ancient Roman times. Macartacus (Dessie Gallagher) has led his men into battle after surviving a series of qualifying jousts. 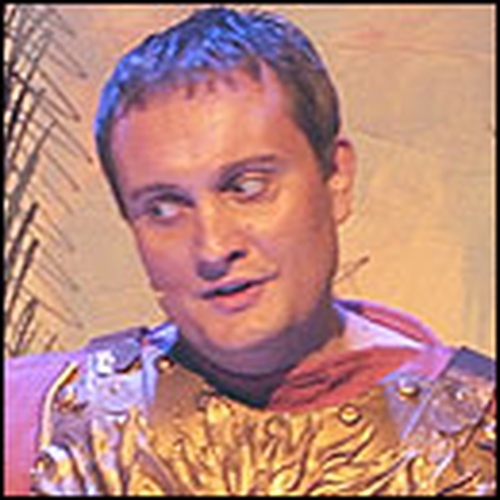 However, many view Keano (Mario Rosenstock) as the real leader. A man of ferocious temper and high standards, his animosity towards Macartacus reaches new heights when the Federation (FAI) fail to prepare properly for the final battle. Quinness (Risteárd Cooper) and Packie Bonnerus (Paul McGlinchey) are also on the receiving end of much vitriol and belittling in equal measure, as they take sides with Macartacus and the Federation. Matthews and Nugent leave you in no doubt as to who has been sinned against in this pantomime for adults. Messrs McCarthy, Quinn and Bonner may not be pleased with their depictions, while Ridiculus, as played by Gary Cooke, emerged as a blatant ridicule of an FAI official (for the life of me, I don't know which official it is). I Keano has received much advance publicity, and by and large it does live up to the hype, though with some reservations. Trying to sustain a thoroughly satisfying comedic experience over two hours is a challenge. Some of the gags told through song and in monologue form, didn't always hit the mark in I Keano, while some of the references to present day people and situations only served to throw the narrative off kilter. On a more positive note, some set pieces worked a treat such as Quinneses ditty about his love for all the children of the world, and the clever pastiche on Queen's Bohemian Rhapsody when Macartacus and Keano questioned their actions after the fall out. Surfia's (Tara Flynn) transition from washing lady to PR guru and the appearance of Fergie the Dolphin, who would offer Keano advice, also managed to find the net. The performances throughout are top notch, with Mario Rosentock's most famous creation transferring well from the Gift Grub studio to the stage. Risteárd Cooper, while not attempting to sound like Niall Quinn, delivered a well rounded, gullible character. Dessie Gallagher's portrayal of Macartacus was uncannily accurate and a glorious send-up of the manager under pressure. Paul McGlinchey's Packie Bonnerus drew inspiration from Daniel O'Donnell to show us that there is a lot of good in the world. Joe Taylor & Malachy McKenna combined well as the scribes with a nose for a story, who frequently ended up in the free bar. Gary Cooke's all too familiar Dunphy caricature still manages to get the laughs, while Tara Flynn as the token female in this endeavour, more than held her own. A word of praise too for choreographer Carol O'Byrne, who devised some excellent dance routines. To borrow a phrase from a certain football pundit, 'I, Keano is a good show – but not a great show.' However, the fans should still leave with a smile on their face, having just watched their team win without playing all that well.